I just got a new laptop with Windows 7 on it and its really great. But, I went on a 2 month trip and forgot my password and I didn’t write it down either. Now I can’t even get pass the login screen to get into Windows! Please, can someone help me? I’d really appreciate it because I’ve tried everything I can think of. Forgot the login password on your laptop? Your stupid annoying cousin has changed your password? Or something should have gotten mistyped while you was resetting your password and now you can’t log on your laptop? The most common method of unlocking a laptop is to boot up in Safe Mode by pressing F8 when the BIOS screen appears and log onto the built-in administrator account. Hopefully this account doesn’t have a password and it’s not disabled, but most of the time it does not. In this tutorial we’ll show you how to unlock a laptop if you forgot your Windows 8/7/Vista/XP password. No matter what situation you are in, you can always unlock/reset the forgotten password on your laptop by following the instructions below. How to Unlock A Laptop If You Forgot Your Password? 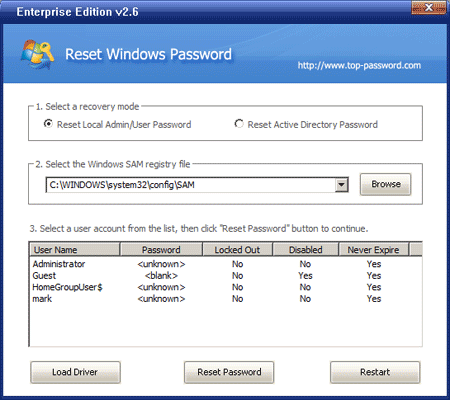 First, you will need to download the Reset Windows Password utility on another PC that you can access. This can be your work PC, or a friend or family member’s PC. Next, insert the CD or USB flash drive into your locked laptop and boot the laptop from it. If you don’t know how to set your laptop to boot from CD or USB drive, please refer to this guide: How to Boot A Computer from CD or USB Drive. Choose a user account and then click on Reset Password button. The program will remove your forgotten password and unlock/enable this user account instantly. Restart the computer and remove the CD or USB flash drive, you should then be able to log on your laptop without being asked to type a password. It’s essential to have a copy of Reset Windows Password utility before something inevitably happens to your laptop. Especially when you forgot your password and need to use your laptop urgently, you can use it to unlock your laptop quickly and easily.